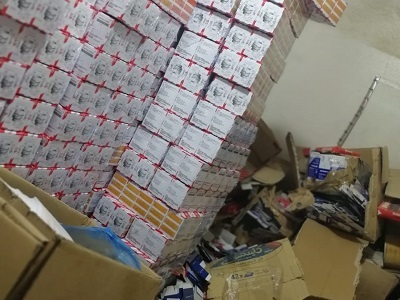 Following an intensive investigation process, supported by the joint security campaign in cooperation with the Ministry of Labor, the Ministry of Commerce and Investment (MCI) inspection teams were able to seize more than 29,000 spare parts, including fake and counterfeit oil and air filters, bearing forged trademarks, at a warehouse in Riyadh. The joint security campaign raided printing toner refilling plant, where a large quantity of counterfeit toner seized and confiscated. During this inspection campaign, a suspected cover-up case was disclosed, besides arresting 26 illegal labors. The joint security campaign received a tip about a plant in Riyadh involved in re-packaging fake spare parts imported from China, and labeling them of forged famous international brands. 29,200 auto spare parts were seized, including (oil and air filters for cars) ), also 382,000 cartons and stickers, bearing forged international famous brands. With the support of the joint security campaign, MCI inspection teams raided a plant run by an Asian expat in Riyadh, at Al-Olya neighborhood. Inside the plant, more than 9,000 counterfeit and fake toner cartridges were seized, bearing forged famous brands, in addition to tools and equipment used to re-fill the cartridges. The illegal labors were handed over to the security authority, while the owner of the violating plant was summoned by the Ministry for further investigation and to be referred to the Public Prosecution. The Ministry of Commerce and Investment confirms the continuation of addressing those violating the Anti-Commercial Fraud Law and the Trademark System, by taking stern measures and imposing the legal penalties against them, in view of the fraud and deception towards the consumers. The Rules and Regulations related to Anti-Commercial Fraud Law stipulate penalties that may reach to three-year imprisonment, fines up to one million riyals or both, Defamation in two local newspapers at the expense of the violator, deportation of the illegal labors from the Kingdom, besides the suspension and prevention of practicing the same commercial activity.